This article is the first follow-up to my earlier article, Practice Makes Perfect, Right? 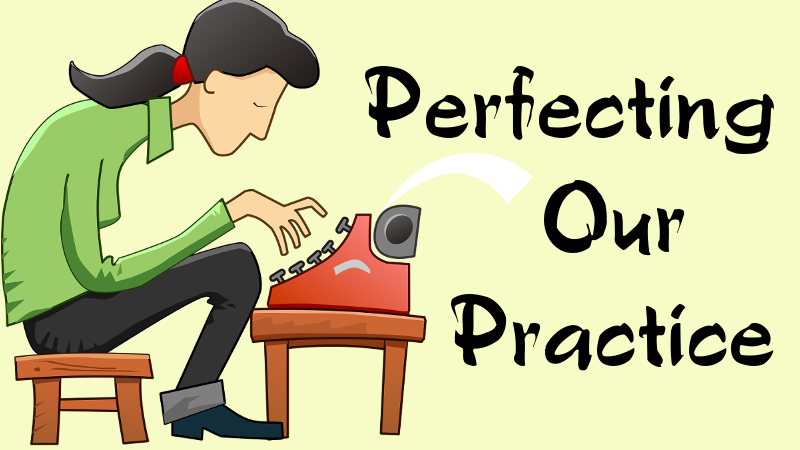 My goal, as this series continues, is to provide more concrete examples that demonstrate effective ways we writers can improve our habits when writing and increase our chances of becoming more competent at our craft. These examples might not fit your writing habits, but maybe they will help you brainstorm ways to improve your own practice. Every writer is different and we each have our own journey. It might take some time to find the right path and that’s okay. As long as you keep working to improve and continue to be honest with yourself about your weaknesses, you’ll continue to make progress. Let’s say you’re a relatively inexperienced writer. Maybe you’ve tried some workshopping, but all those revisions frustrate you. So you start freewriting. Every day you sit down and freewrite for five or ten or fifteen minutes. Whatever you feel like. You just put words on the page. Then you spend five or ten minutes, if you feel like it, cleaning up your typos, adding some better punctuation. You say to yourself, “There. That’s good enough.” If you went over it and cleaned it up, you might even consider it edited. Then you post it to your blog and forget all about it. The issue here is that you build up bad habits. I’ve personally seen severe regression in the abilities of writers who do this too much. They keep telling themselves their writing is good enough and that destroys their internal editor. Maybe you don’t even know yet what your internal editor is and why you need one. Your internal editor is the voice inside you that lets you look at your writing and see places you can improve it. The more skills you develop as a writer, the louder and more insistent that voice tends to become. Developing balance between your internal editor and the ability to put the words on the page and associate ideas (the skills practiced in freewriting) is a challenge that even experienced writers often struggle with. This is a topic I will be returning to in several more articles about perfecting our practice. So the problem I am trying to point out is that when you keep telling yourself what you wrote is “good enough,” you tell your internal editor to shut up. If someone tells you to shut up enough times, you quit trying and give up. You don’t want your internal editor to give up. You want it to cooperate in finding that magical balance. The struggle we now face is how to improve this practice without making you so frustrated that you give up or giving your internal editor too much power and crippling yourself from putting words on the page. But I’ve got your back here and I’m going to try to suggest a method that might work for you. If you want to improve as a writer, it’s worth trying. And you can tweak my suggestions until you find something that works with how you write and how your brain works. The key here is to learn how and when to set aside the internal editor and when to engage it again. Only doing freewriting doesn’t help you learn about revising and editing. Those skills are just as essential to being a writer as being able to get the words on the page to begin with. Instead of only freewriting, try freewriting for 2-3 days to help yourself get writing–to practice getting the words on the page. But consider not sharing them just yet. Accept that they’re “not good enough,” because they aren’t fully edited and revised yet, so don’t reflect the best work you are capable of. Remember, however, they serve a purpose–to get your juices flowing. Or even as the basis for a wonderful story yet to be revised, edited, and maybe completed. Next, sit down and take the best bits out of those freewrites and work to turn it into a story. Because maybe you’re not very experienced, you might get stuck making the beginning, middle, and end. But you try. If you can, get a couple people to talk the tricky bits through with you to make a full story. Then you submit it to your workshop, leaving notes if you need to about the bits that need help. While you wait for your group to get back to you, you do some more freewriting, keeping in mind what you learned making your story. When one inspires you a bit, you pillage it to start a story. Maybe you can keep going on your own and start building a new story, or maybe you do some focused freewriting (aka sprints) to get ideas for the continuation of the story. When your group gets back to you, you sit down and edit that first story. Then you take this other story you’ve been working on or a few of those freewrites you liked best and you go through and apply all those skills you learned from workshopping to them. It might take several days to do all this editing and if you get frustrated, you take a break or do some more short freewrites just to vary things. After a little time away from your first workshopped story, you look it over again and resubmit to your group. Repeat as needed. Your freewrites are saved for scrounging bits from. You’re building up writing “muscle memory” and learning to let the editor go so the words can flow out the way you need and want them to. As you gain skills, you can start editing more and more of your freewrites before you put them aside, applying what you learn in your workshopping. You may even find that your freewrites become “cleaner” with less issues that need to be cleaned up in the editing process. This is the feedback loop you want to engage in order to continuously improve as a writer. It’s especially important that you keep self-editing that growing pile of story drafts or partial story drafts to bring them up to your current level of knowledge. Now you’ve got that perfect practice. You build skills through workshopping and the workshopping and self-editing trains your writer muscles to get better, so your freewrites are even getting better. The improvement is especially apparent with the changes you make cleaning them up after each freewrite. You know some freewrites belong in the trash bin, but others you’ll come back to some day and build into stories. Continuing to freewrite as you go helps keep your creative juices flowing, gets you in the habit of writing, and keeps you from burning out with the frustrations of the learning process. Let’s simplify this a bit. What are the keys to perfecting this practice? Building awareness of the need for and possibility of growth. Finding a route to gain more knowledge and get intelligent unbiased feedback on your work. Staying positive by allowing yourself to be imperfect and finding pride in each step you take towards improvement. Practicing the things you learn on the journey so you reinforce those skills. What about your own practice? Do you have enough of these keys in your regular writing habits?